Big Air Trampoline Park is Leaping into Charlotte, NC! An industry-leading trampoline park company plans to bring families together like never before in Charlotte, North Carolina. 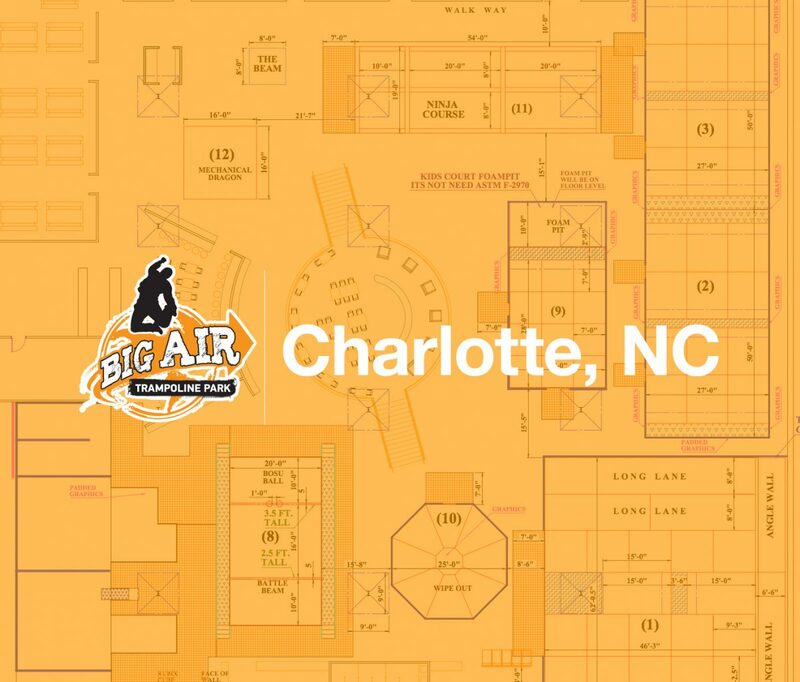 Big Air Trampoline Park®, a Southern California-based trampoline park company today announced a new franchise to be located in Charlotte, North Carolina. The park will be opened by franchisees Jon and Deborah Cox and will join a growing family of two corporate stores in California, and a franchise in South Carolina. Big Air Charlotte will bring to local families a unique experience that combines Big Air’s state-of-the-art attractions and industry-leading safety measures. Highlights include Big Air’s award-winning birthday party program, and an innovative attraction mix including their trademarked Battlebeam® and The Bullpen. In addition, Big Air Charlotte will also include a three-lane obstacle course, a wipeout-style attraction, and two unique climbing experiences: Faceoff and Rubik’s Tower. Guests can pay by the hour, or take advantage of the affordable Big Air Memberships™ program, the nation’s first no contract, monthly membership option offered by a trampoline park. Big Air Charlotte is anticipating a late Summer 2017 opening, and will be located at 2408 Sardis Road North in Charlotte, NC, joining Burlington Coat Factory and others at Crown Pointe Plaza. Southern California-based Big Air Trampoline Park® is making leaps and bounds in the family entertainment industry. Founded in 2012, Big Air is led by an executive team with over 30 years of experience in the entertainment industry. With trademarked attractions like Battlebeam®, events like Toddler Time®, and an award-winning birthday party program, Big Air offers a brand experience that is second-to-none. The company is now expanding across the United States through franchising, with a program that offers exceptional support in location analysis, construction, park operations, marketing, and more. To learn more about franchising opportunities, visit bigairfranchising.com.